Speaking at the Heritage Foundation this morning, US Secretary of State Mike Pompeo practically declared war on Iran. His unprecedented threats against Iran went even beyond what President Trump had said in the past. After 12 years of intensive talks, initially between Britain, France and Germany (the EU-3), and finally between Iran and the five permanent members of the Security Council plus Germany (P5+1), Iran and the leading world powers reached a landmark agreement. The nuclear deal (officially known as the Joint Comprehensive Plan of Action or JCPOA) was the result of the efforts of the greatest experts in nuclear non-proliferation, including experts from the IAEA and departments of energy and intelligence service of all those countries. Iran’s nuclear programme had started in 1957 with the help of the United States as a part of the Atoms for Peace program, when a “proposed agreement for cooperation in research in the peaceful uses of atomic energy” was announced. During the late 1960s and early 1970s, Mohammad Reza Shah’s government started an ambitious nuclear program. It established the Tehran Nuclear Research Centre in 1967, with a US-supplied 5-megawatt nuclear research reactor, which was fueled by highly enriched uranium. Iran was one of the first countries to sign the Nuclear Non-Proliferation Treaty (NPT) in 1968. The NPT allows all member states to engage in peaceful nuclear activity, including full range of processing, so long as they refrain from manufacturing nuclear weapons. In return, the five recognized nuclear states (the United States, Russia, China, Britain and France) promised to move towards the elimination of their nuclear weapons in “good faith”. Not only have they not fulfilled this requirement, on the contrary, they have continued to develop more and more deadly and sophisticated nuclear weapons, and they have also been joined by India, Pakistan, Israel and recently by North Korea. In 1974, with US backing, the Shah approved plans to construct up to 23 nuclear power stations, producing 23,000 megawatts of electricity. US and European companies competed against each other to help build those reactors. In 1975, the Erlangen/Frankfurt firm signed a contract worth up to $6 billion to build the first nuclear power station in Bushehr. President Ford signed a directive in 1976 offering Iran the chance to buy and operate US built power stations, including a U.S.-built reprocessing facility for extracting plutonium from nuclear reactor fuel. After the Islamic Revolution, all those programmes were suspended, including the Bushehr power station that was nearly complete. The start of the eight-year long Iran-Iraq war further delayed the resumption of the nuclear program. Eventually, in 1981 during the presidency of the late Akbar Hashemi-Rafsanjani, Iranian officials decided that the country’s nuclear development should continue. They turned to the Western countries that had promised to build reactors in Iran to resume their work, but all of them refused to cooperate. In 1983, IAEA officials were keen to assist Iran in various aspects of reactor fuel fabrication, chemical engineering and design aspects of pilot plants for uranium conversion, corrosion of nuclear materials, LWR fuel fabrication, and pilot plant development for production of nuclear grade UO2. However, contrary to NPT regulations, the United States directly intervened to discourage IAEA assistance to Iran. Finally, Iran turned to China, but under US pressure China too dropped her nuclear commerce with Iran. However, Iran was successful to persuade Russia to complete the Bushehr reactor, which was completed after long delay and at great cost to Iran. Faced with this situation, Iran decided to conduct her own work on nuclear enrichment, in which she succeeded. The United States imposed unilateral sanctions on Iran and forced other countries to follow suit. Iran was taken to the Security Council, which also imposed crippling sanctions that cut Iran’s oil exports by half and cost Iran billions of dollars in lost revenue. Iran continued with her nuclear programme and increased the number of her centrifuges, despite threats of war, crippling sanctions, cyber sabotage, the assassination of her nuclear scientists by Israeli agents, etc. It was only after President Barack Obama agreed that as a member of the NPT Iran was entitled to a peaceful nuclear programme that intense negotiations started, resulting in the JCPOA. While establishing her right to engage in nuclear activity, Iran accepted the harshest conditions as confidence-building measures. The agreement reduced Iran’s enriched uranium stockpile by 98 percent and restricted the level of enrichment to 3.67 percent. Given that an enrichment level of more than 90 percent is needed to build a nuclear bomb, the deal makes it impossible for Iran’s uranium to be weaponized. Under the deal, Iran also reduced the number of its centrifuges from 20,000 to a little over 5,000, far below the number that would be needed for manufacturing a single bomb, even if she wanted to do so. Iran closed the Arak reactor, which was capable of producing plutonium, and agreed to severe restrictions on research and development activities in other facilities. In short, the agreement made it virtually impossible for Iran to build a single bomb. “First, Iran must declare to the IAEA full account of prior military dimension of its nuclear programme, and permanently and verifiably abandon such work in perpetuity”. This is something that was pursued under PMU or Possible Military Use during the talks. The IAEA studied all those allegations, including taking soil samples from Parchin military base where the Israelis had claimed that nuclear activity had been conducted. The IAEA decided that there had been “no diversion” of nuclear material for military use. Iran has agreed to abandon work on nuclear weapons in perpetuity, and all the talk about so-called “sunset clauses” is baseless. In addition to being a member of the NPT, Iran has also joined the “Additional Protocol”, which requires continuous, unannounced inspections of all her nuclear sites, and she has also given an undertaking never to produce nuclear weapons. The prohibitions do not stop at the end of the “sunset clauses”, but will continue in perpetuity. The IAEA that is the only legal body in charge of monitoring the deal has, on eleven separate occasions, certified that Iran has fully complied with the terms of the deal. Demanding that Iran should stop enrichment goes against NPT rules. As for “never pursuing plutonium reprocessing”, this is precisely what Iran has agreed to do under the JCPOA, and has destroyed her heavy water reactor. This is again another provision of the JCPOA, which the IAEA has used on many occasions. This is yet another misleading and illegal demand. Like any other country, Iran has the right to defend herself (UN Chater Art 51) and as she is unable to acquire advanced military equipment that the United States has readily sold to all Iranian neighbours, Iran’s missiles are her only means of deterring a military aggression. Iran does not have intercontinental ballistic missiles as she has limited the range of her missiles to 2,000 kilometres. They are not designed to carry nuclear weapons, and in any case Iran does not have nuclear warheads. 5) Pompeo accused Iran of spreading terrorism in Syria, Iraq, Yemen, etc. Iran has been fighting against ISIS and other terrorists in Iraq and Syria at the invitation of the governments of those countries. It is up to the Syrian government to ask Iran to withdraw her forces from that country, not for a US Secretary of State to dictate to other countries what they should and should not do. All experts agree that the mantra of “Iran-backed Houthis” is exaggerated propaganda, as Iran’s contacts with the Houthis and influence over them is minimal. It is Saudi Arabia and members of her coalition who, with American support, have been bombing Yemen, killing and wounding tens of thousands of innocent people and creating the world’s greatest humanitarian catastrophe there. President Trump and his three senior officials, Mike Pompeo, John Bolton and Rudy Giuliani, seem to be preparing the ground for a disastrous war with Iran. Their hostility towards Iran does not seem to have anything to do with Iran’s nuclear programme, but has everything to do with an obsession for regime change. Some of his hostility towards Iran seems to have been based on his hatred of Islam. 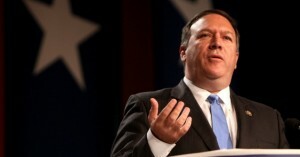 In 2015, Pompeo, then a Congressman, attacked Barack Obama, who, according to him, took the side of the “Islamic East” in its conflict with the “Christian West”. “Every time there has been a conflict between the Christian West and the Islamic East, the data points all point to a single direction,” he said. 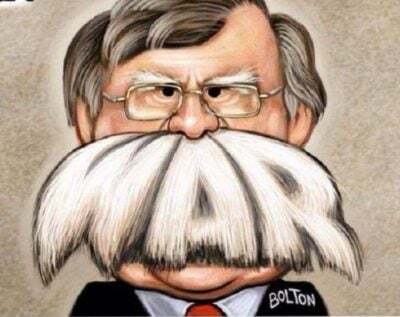 John Bolton is another strong advocate of regime change in Iran. 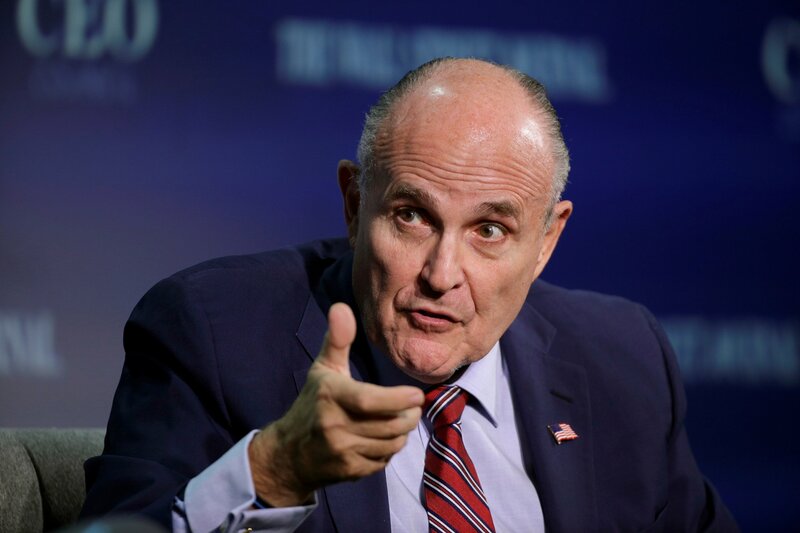 The former Mayor of New York, Rudy Giuliani, who is now a member of Trump’s legal team has also been a fervent advocate of regime change in Iran. This obsession with the past and a deliberate decision to bring about a regime change in Iran will have incalculable costs. Let’s not forget that prior to Iraq war, Paul Wolfowitz, one of the authors of that war, predicted that it would be a “cake walk”, that it “would pay for itself”, and that “US forces would be welcomed with roses”. Fifteen years after that disastrous war, American forces are still operating in that country, and the war which has cost trillions of dollars to US taxpayers has killed and wounded millions of innocent Iraqi people, shattered that country and has given rise to a number of vicious terrorist movements. It should be clear to everyone who is familiar with the Middle East that a war against Iran will not be like Iraq, it will be much worse. It will kill hundreds of thousands of innocent people, will set the Middle East on fire and will do a great damage to Israel and other US allies that she seemingly wishes to support. This kind of aggressive, bullying, threatening, demanding and illegal language has not been heard from a responsible government official since before the Second World War. The concept of Americans being unique and exceptional and almost chosen by God, and referring to other nations as inferior, in the way that President Trump referred to the Latinos as animals, is not far removed from the concept of a superior race and Der Untermensch, or subhuman people. If we wish to avoid the horrors of the Second World, we must put an end to this kind of arrogant mentality. It is time for the Europeans, for all the peace-loving Americans and for millions of concerned people across the world who will be paying the cost of this misadventure to stop this madness before it is too late. 1. Aspen Security Forum, The View from Langley, July 20, 2017. 2. “Rep. Mike Pompeo: One year later, Obama’s Iran nuclear deal puts us at increased risk”, Fox News Opinion, July 14, 2016. 3. Raphael Ahren, “With anti-Iran, pro-Israel stances, Pompeo may become Jerusalem’s new darling”, The Times of Israel, 14 March 2018. 4. Peter Beinart, “Mike Pompeo at State Would Enable Trump’s Worst Instincts”, The Atlantic, Nov 30, 2017. 5. “Beyond the Iran Nuclear Deal: US policy should be to end the Islamic Republic before its 40th anniversary”, Wall Street Journal, Jan 15, 2018. 6. “Rudy Giuliani speaks at Iran Freedom Convention”, CBSN, May 5, 2018. 7. USA: ‘US exceptional, Russia is not’ – Trump’s Sec of State pick Pompeo on YouTube here.